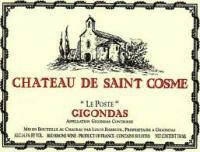 2012 Saint Cosme Gigondas 1.5ltr - $76.99: Vins Rare, The finest selection of rare wines. Moving to the releases in barrel, the 2012 Gigondas (60% Grenache and the balance mostly Mourvedre, with some Syrah) has plenty of potential, with juicy black raspberry, sweet spice, licorice and toasty notes as well as medium to full-bodied richness and depth on the palate. Nicely balanced, it shows the purity of the vintage, as well as a relatively approachable style that should allow it to drink nicely on release.